Parabola : In algebra, dealing with parabolas usually means graphing quadratics or finding the max/min points (that is, the vertices) of parabolas for quadratic word problems. In the context of conics, however, there are some additional considerations. There are different types of equations in which, we get a parabola. 1) y 2 = 4ax for a >0. The parabola is, therefore, symmetrical about x-axis, which is the axis of symmetry of parabola. 2) y 2 = -4ax for a < 0, x may have negative value or zero but no positive value. Therefore, in this case the parabola opens to left. The axis of symmetry is again the x-axis. 3) x 2 = 4ay for a > 0. In this case parabola opens upward. The axis of symmetry is the y-axis. 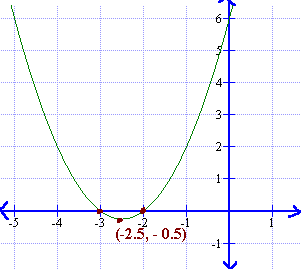 4) y 2 = -4ay for a < 0.The parabola opens downward and the axis of symmetry is again the y-axis. ∴ x- intercepts are x = -3 and x = -2. Mark these points on the x- axis. Mark the coordinates of vertex in the graph. Now, join x-intercepts and vertex as a curve. This curve is a Parabola. 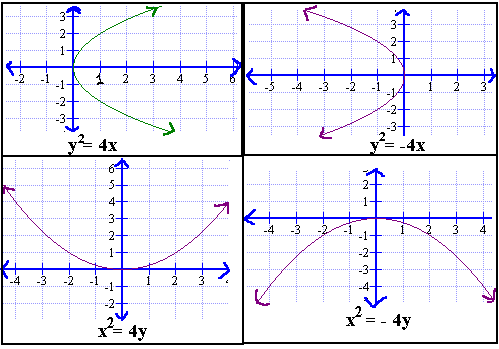 2)	When vertex as origin there are 4 types of parabola.